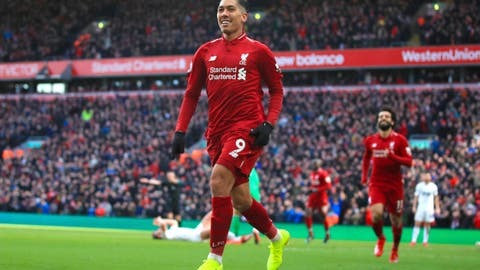 LIVERPOOL, England (AP) — Liverpool came from behind to beat Burnley 4-2 in high winds and occasional driving rain on Sunday, reducing Manchester City’s Premier League lead back to one point. Relegation-threatened Burnley took an early lead at Anfield in unusual fashion as Ashley Westwood’s sixth-minute corner curled straight into the far top corner of the net. Key to Liverpool’s turnaround was Adam Lallana, who — in only his fifth start of the season — had a hand in the first two goals for Roberto Firmino and Sadio Mane. Firmino and Mane also scored in the second half, with Mane’s the last kick of the game seconds after substitute Johan Berg Gudmundsson had scored a stoppage-time goal for Burnley. While Liverpool is second in the standings, Burnley is two points above the relegation zone.